Crain in 1997 at 235 pounds. After my big run last Friday, I did a bunch of basic recovery stuff, hiking, biking, and skiing. Sunday I went for a run on Superstar. My legs betrayed me, and I crossed my tips and did a belly flop onto my face… I completely shredded my right elbow, leaving a blood stain on the snow. I consider it a win, as it was only one elbow, and it involved no hands or my face (usually I lead with my face to protect my elbows and hands). In other cross-training news, I recently bought a Giant Defy Advanced Two road bike. It is a killer ride! I got it from Tony at Alpine Bike Works, the new shop in Killington. I got it specifically for cross training so that I can spend less time pounding my joints running. The immediate result was an incredible jump in my flexibility after only a couple of 10-12 mile flat rides. 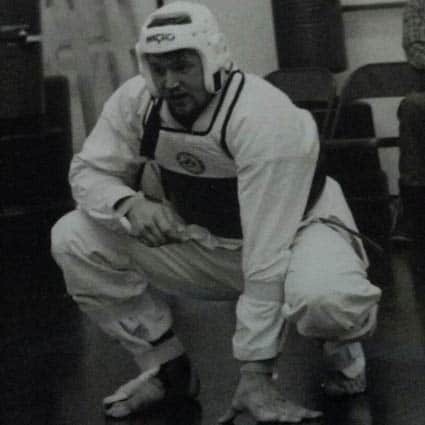 Back when I was a full contact Taekwondo fighter 15 years ago (blackbelt heavyweight division) I was as flexible as a noodle despite being 255 pounds, at one point. Out of training nine years, I have lost that flexibility. After two rides I was able to put my forehead back on my knee in a single leg hamstring stretch. I was floored! My first run after the elbow incident was on Tuesday. I did a 17+ circuit of Killington Road, Route 4, and East Mountain Road to the top of Killington Road and down, with a lap on Schoolhouse Road. And this brings me to the slapping and the squishing. East Mountain Road is the kind of brutal, stupid climb that drill sergeants dream of. It is so steep that it is nearly impossible to run up it. It is so steep that people actually shout encouragement to strangers running up it, holding up peace signs, yelling “You’re almost there” and occasionally offering a cool drink or crystal meth (I politely decline). East Mountain Road is the kind of brutal stupidity that reminds me of when I spent a month building and tearing down staging at Woodstock ‘94. I hated it, everyone hated it, but the longer ago it gets, the more we loved it, and the more we brag about it. The East Mountain Road climb started eight miles into my run, so I decided to take a break, sit down, stretch, eat some nuts, drink some water, etc. I even decided to go down to the brook and splash some water on my face, which is when I dunked my entire right foot in the river… eight miles from home, at the bottom of a brutal climb. Fabulous. So I slogged up the hill, hating the hill, swearing at the hill, swearing at my squishy shoe. When I topped the first level rise it felt so good that I actually let loose with a Howard Dean “YEAH!” Also, my shoe was nearly dry, so I chilled out. But seriously. I curse East Mountain Road. The week’s big run, however, was Friday. It was 28.5 miles. I ran Killington Road top to bottom twice for about 20 miles, and then did laps on Schoolhouse Road for the last 8.5 miles because I was desperate to run on something flat. I took longish breaks at 10 and 20 miles, assessing if I should push. I was a little stiff (OK a lot stiff) by the end of the run, and unlike at any other point during the run, I was desperately thirsty. It was thirst that actually took me off the road, not fatigue or pain. I had planned this run out, but it was really hard to get moving at five in the morning, and there was not one single mile that went by where I did not spend half of it trying to convince myself to quit. I didn’t even hurt that badly. I just did not want to do it. Half the battle is showing up. The other half is not quitting. When it comes down to it, it’s a mental battle more than a physical one. Once again, I topped off my run with skiing delicious creamy bumps on the Superstar Glacier. Recovery for the knees, hips, and soul! Finally, I have to print a retraction for my friends in Quebec; this event that I am training for is not in the Chic Chocs, but in the Laurentians (I was nearly lynched for that one).